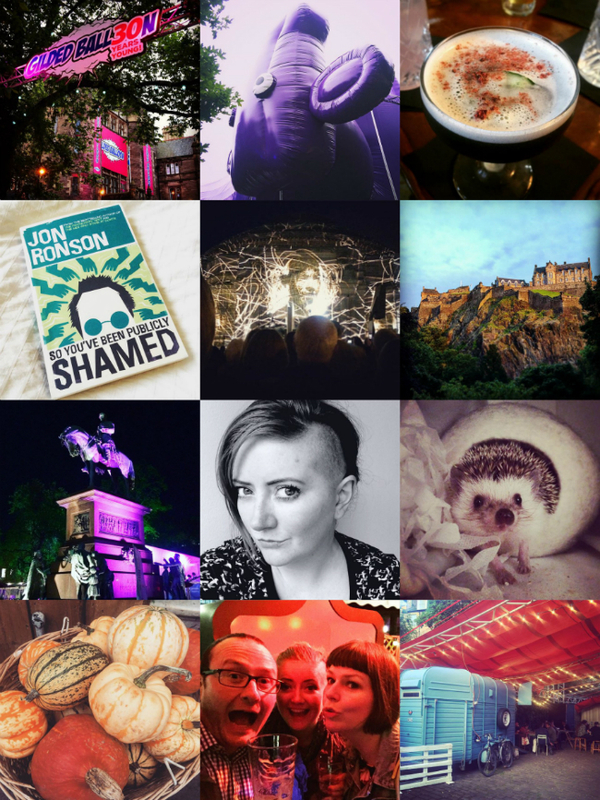 As always, my August revolves completely around Edinburgh's summer festivals. It's a seriously FULL ON four weeks of comedy and culture and super late nights with the nicest of people. I also managed to do some seriously grown up things in August (more on this soon! ), so I'm pretty knackered now, and I'm glad to have some early nights where I don't have to do anything (I'm getting old). Here's what last month looked like. 1. I spent most of my Fringe at the Gilded Balloon - a turreted Hogwarts-style building, that turns into a student union the rest of the year. It's got a lovely little secret bar on the top floor that is my favourite place to hang out in the festival - you're surrounded by old rooftops and fairy lights and millions of comedians, it is ace! 2. I'm also a fan of the massive cow that arrives in Edinburgh each year. One of the best shows I saw this year was Sam Simmons - he's a really silly but wonderful comedian. If he's performing anywhere near you, I highly recommend him! 3. In Edinburgh in August, almost every space is turned into a festival venue, and one of my favourites was the Hendrick's pop up bar. It was like walking into an eccentric Victorian's drawing room, filled with taxidermies and curiosities, and amazing cocktails. This one, the Hendricks Black Rose, was incredible - gin, cocchi rosa, cointreau, egg white, charcoal and rose dust. 4. It wasn't all partying! I read the new Jon Ronson book and I really enjoyed it! It looks at people who've been publicly shamed, the effect it's had on their life, and how it can take surprisingly little to rile up an internet storm. Definitely worth a read. 5. My favourite thing at the Festivals was, by far, the Harmonium Project by the Edinburgh International Festival (you can watch a short video at that link). It was an absolutely beautiful event, animations where projected onto one of Edinburgh's most iconic buildings to the sounds of the Edinburgh Festival Chorus. About 20,000 people came to watch it, and the atmosphere was amazing. Go EIF! 6. After a seriously miserable July, summer finally seemed to roll around, and August was filled with beautiful sunny evenings. It's easy to miss familiar sights, but I couldn't believe how beautiful the castle looked one night. It was golden and lovely, and absolutely everyone was stopping to look at it. 7. I went to see the amazing Michel Faber at the Book Festival. He was talking about his newest book, The Book of Strange New Things, and it was heart-breaking and beautiful. His wife was diagnosed with cancer as he was writing the novel, and he just spoke so beautifully about love and loss and life. I wish I had made it to more Book Festival events, but it was a treat to attend this one. 8. It's been a year since I got my undercut, and I still absolutely love it (and seem to be on my way to shaving my whole head!). I know it's going to be a nightmare to grow out, but I don't care - that still feels like a long, long way away. 9. It's Soba! He's still super cute, he's still super grumpy. Riley (the cat) is here to visit again, and Soba remains completely unconcerned by a cat that is fascinated by him, but is terrified by the sound of an unexpected sneeze. Hedgehogs are complicated creatures. 10. Autumn is on the way! I went for brunch at Canonmills (to a lovely little breakfast spot called the Water of Leith Bistro), and spotted these lovely little pumpkins and squashes outside Earthy. I've already had my first pumpkin spice latte of the year and I was SO excited about it. I'm such a loser. 12. ...I went to this super cool pop-up coffee, doughnuts and absinthe bar (I want it to stay year-round! ), saw the AMAZING Puddles Pity Party (seriously, look up his youtube videos! So good), watched Pappy's Fun Club for the first time, and stayed out til 4am with my brilliant pals. WIN BECKSONDERGAARD CAPES FOR YOU & YOUR BESTIE!